The recipe is from a book written in 2015 by the baker of the actual Prince Harry-Meghan Markle confection. No dessert has received more attention lately than the cake that will be on display at the May 19 wedding of Prince Harry and Meghan Markle. 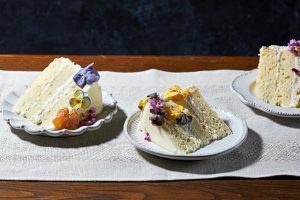 All we know is American expat Claire Ptak, owner of Violet bakery in London, is making a lemon elderflower cake that will be decorated with buttercream and fresh flowers. You can make a lemon elderflower cake that suits your skill level such as omitting the filling and using frosting in between the cake layers, or just plain lemon curd. I smelled a challenge. Could I come up with my own version of the royal wedding cake for us commoners? 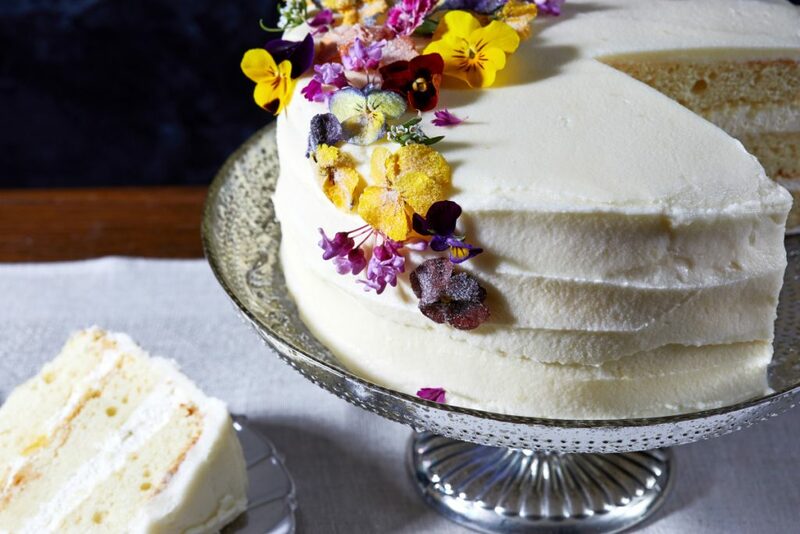 This recipe is a rich-tasting and lovely interpretation of the lemon elderflower cake that will be made by Claire Ptak and served at the wedding of Prince Harry and Meghan Markle. Feel free to adapt this recipe to suit your time and skill level. You can omit the filling and use frosting in between the cake layers, or just plain lemon curd. You can decorate the cake with fresh or crystallized edible flowers (be sure they have been grown for culinary use). If you abstain from alcohol or don’t want to buy the St-Germain called for here, you can leave it out or use more of the elderflower cordial in its place. Place the granulated sugar in the bowl of a stand mixer or handheld electric mixer. Use your clean fingers to rub the lemon zest into the sugar until the sugar is aromatic and moist. Add the butter; beat on medium-high speed for about 3 minutes, or until the mixture is fluffy and light. Meanwhile, lightly whisk together the eggs, vanilla extract and salt in a liquid measuring cup. Reduce the mixer speed to low; gradually add to the butter-sugar mixture until fully incorporated. Stop to scrape down the bowl. Whisk together the flour and baking powder in a separate bowl, then add half of it to the butter mixture. Beat on low speed until just combined, then add the milk and the elderflower liqueur, if using. Beat on low speed, until well incorporated. Bake (middle rack) for 15 to 20 minutes, until the top of each cake layer springs back to the touch. The edges will be very lightly browned and starting to pull away from the sides of the pans. Cool in the pans for 15 minutes, then run a round-edged knife or offset spatula around the inside of the pans to release the layers. Invert onto a wire rack and peel off the parchment paper. Use a pastry brush or silicone brush to apply the elderflower cordial a total of four times, allowing a few minutes in between so the liquid is absorbed. Use a flexible spatula to gently fold in half of the lemon curd, lifting cream from the bottom of the bowl over the top of the cream, rotating the bowl as you work. Be careful not to deflate the cream too much. Fold in the remaining lemon curd. Cover the bowl with plastic wrap and place in the refrigerator until you’re ready to fill the cake. FOR THE FROSTING: Combine the butter and 2 cups of the confectioners’ sugar in the bowl of a stand mixer or handheld electric mixer. Beat on low speed and then increase to medium-high. Stop to scrape down the sides of the bowl. On medium-low speed, gradually add the milk, beating until combined. Add 2 more cups of confectioners’ sugar and beat on low speed for at least 3 minutes. The mixture should be smooth. Add the lemon zest and juice and the St-Germain, if using; beat on low speed until incorporated. Continue adding more confectioners’ sugar until you get the right consistency (this can vary somewhat depending on the temperature of your kitchen and how soft the butter was initially); the frosting needs to be thin enough to spread but thick enough to not run off the cake. It’s perfectly fine to let the frosting chill for a bit in the refrigerator; you may need to briefly beat it again to smooth it back out. To assemble the cake, place a dab of frosting in the middle of a 9- or 10-inch cardboard cake round (you could also just place the cake directly on a large plate, ideally with little or no rim). Place one cake layer in the center, with the cordial-soaked side facing up. Use a pastry bag fitted with a large round tip or zip-top bag with one corner cut off to squeeze a border of frosting around the top of the cake, just inside the edge. This will serve as a kind of dam to hold in the filling. Use an offset spatula or spoon to spread half the filling inside the ring of frosting. Place the next cake layer on top, also cordial-brushed side up. Repeat with another ring of frosting and the rest of the filling. Lay the final cake layer on top. Place a small amount of frosting in a separate bowl for the crumb coat, which is a base layer of frosting that helps to seal in the crumbs and give you a smooth surface to which you can apply the rest of the frosting. Use an offset spatula or table knife to apply the thin crumb coat all over the top and sides of the cake. Transfer the cake to the refrigerator for 20 to 30 minutes, to let the crumb coat set. Apply the remaining frosting to the cake, and decorate the top with crystallized and/or fresh flowers, if using. Return the cake to the refrigerator to the let the frosting firm back up, another 20 or 30 minutes. Because of the soft filling and frosting, the cake is easier to cut when it’s still cool – just out of the refrigerator. (By the time everyone eats the cake, its temperature will be just right.) Let the cake sit at room temperature for just a few minutes before cutting into slices and serving. Line a baking sheet with parchment paper. Stir together the egg white with a few drops of water in a small bowl. Use a small brush to paint the surface of each flower with a light coating of the egg white mixture. If you are dipping the flower instead, gently squeeze off any excess. Place each flower coated side up in a shallow dish, such as a glass pie plate, and sprinkle it with the sugar. Don’t overdo it – you still want to be able to see the flower. Use tweezers, the tips of your fingers or an offset spatula to transfer the flowers to the baking sheet as you work. Discard any excess sugar and egg white mixture. Allow the flowers to dry at room temperature at least overnight, or up to 24 hours. When you’re ready to use them, gently remove them from the paper, because they will stick a little (an offset spatula is handy for dislodging them).